When building a regression model with categorical variables with more than two levels (ie “Cold”, “Freezing”, “Warm”) R is doing internally some transformation to be able to compute regression coefficient. What R is doing is that it is turning your categorical variables into a set of contrasts, this number of contrasts is the number of level in the variable (3 in the example above) minus 1. Here I will present three ways to set the contrasts and depending on your research question and your variables one might be more appropriate than the others. The first coefficient, the intercept, is the estimated average for the baseline group, which in our case is the control group (in the control group the biomass is estimated to be on average 11.49). 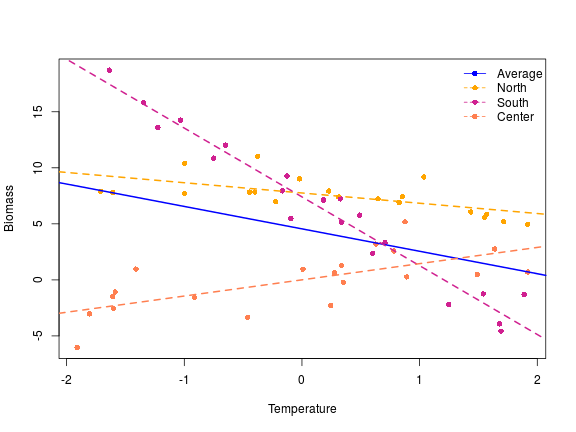 The second coefficient “flow” is the estimated difference between the average in the baseline group and the average in the “low” group (this group has an increase in 3.03 biomass compared to the control group). Similarly the third coefficient is the difference between the average in the baseline and the “high” group (this group has an increase of 6.16 biomass compared to the control group). Now the meaning of the various coefficient is different, the intercept is the average biomass over all the levels (across control, low and high), f1 is the difference between the average of the first level (control) and the average of the second one (low), plants in the treatment low have a 3.11 increase in biomass. f2 is the difference between the average of control and low and the average of high treatment. To put this differently, if we put together the data from the control and low treatment and compare there average value to the average value of plants in the high treatment we would get fhigh. Mean biomass of the plants in the high treatment is higher by 1.95 than plants of the control and low treatment. This type of contrast is a bit harder to interpret but is well suited for variables where the levels have an order, ie (“0”,“>0 and <5″,”>5 and <10” …), there we can gradually compare the successive levels.